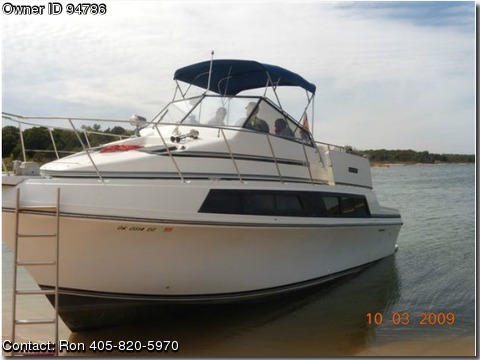 Please contact the owner Ron @ 405-820-5970 with any questions.1986 Carver Mariner,Loaded 32 carver mariner 1986. twin 350 chevy motors, 7.5 kohler, full gally, master state room, full bath and seperate shower, air, heat and many more options. If you are looking for a great boat then you should consider viewing this one. Its an older vessel but in good condition. We have it on lake Texoma ,Soldier Creek marina. Asking $29,995 Call Ron 405-820-5970 e-mail ron.drennan@cox.net THIS BOAT NEEDS TO GO.